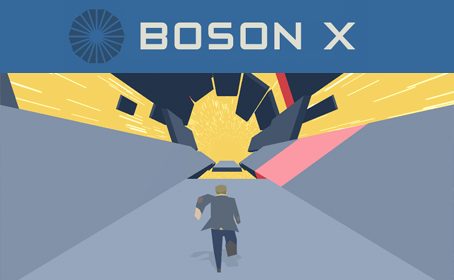 Boson X is now available for PC, Mac and Linux as a free download from our website www.boson-x.com. Each time you die, a Tulip grows at the position of your death. After playing for a while it becomes quite colourful with all the Tulips. I thought this was a nice way to give a sense of progression. I didn&apos;t time myself, but I&apos;d estimate the game took me about 20 hours or so to make. Here&apos;s a timelapse of my desktop while I was making it. If you pay attention you can see that I was going to call the game "Monday" right up until the last minute. Downloads are available for Windows, Linux (64 bit only) and Mac. 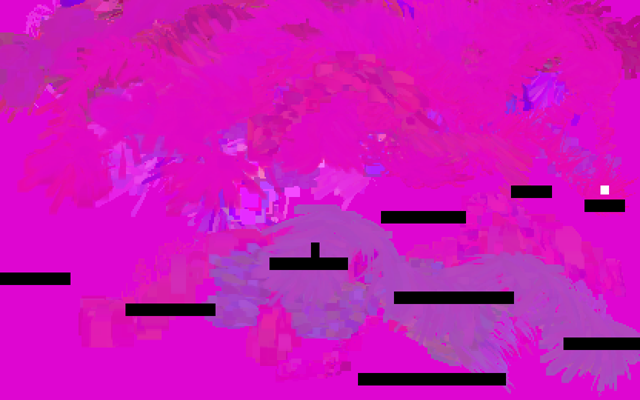 These are some of the new visuals we&apos;ve been developing for Boson X. The function of the blue platforms has changed — they now increase your speed and the aim of the game is to go as fast as possible. Previously their function was to increase the hang time of the player&apos;s jumps, but we decided to change it after exhibiting it at Freeplay this year. We received lot of very constructive feedback at Freeplay and one of the most common critisisms was that the effect of the blue platforms wasn&apos;t very clear. This is a brief video of Boson X running on Android after my previous fix. It renders at a smooth framerate on a Samsung Galaxy S. I don&apos;t have sound working yet though. This is what I got the first time I ran Boson X on Android. The effect is kind of interesting. The problem was some unportable pointer arithmetic in the code that prepared the OpenGL vertex attributes before sending them off to the GPU. It&apos;s fixed now. We have a new game on the way: Boson X.
Boson X is a 3D tunnel-runner about a particle physicist caught in an experiment gone wrong. We&apos;re hoping to release it early next year. We have iOS, Windows and Mac versions of the game running and would like to have an Android port ready as well. No more faffing about with Wordpress&apos;s clunky web interface. The entire site is now handcrafted html (with a few simple scripts to generate the news feed).